Builders Trestles Hire. UK Spec - Ultra Safe Support System. 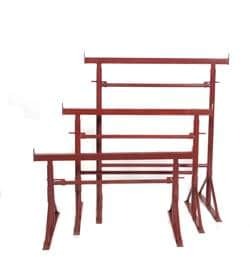 Adjustable Steel Builders Trestles. Four scaffold boards wide, support/use trestles every 1.2m. Available for hire nationwide next day delivery at low rates. Order online today or call a member of our hire desk team for your Builders Trestles Hire.